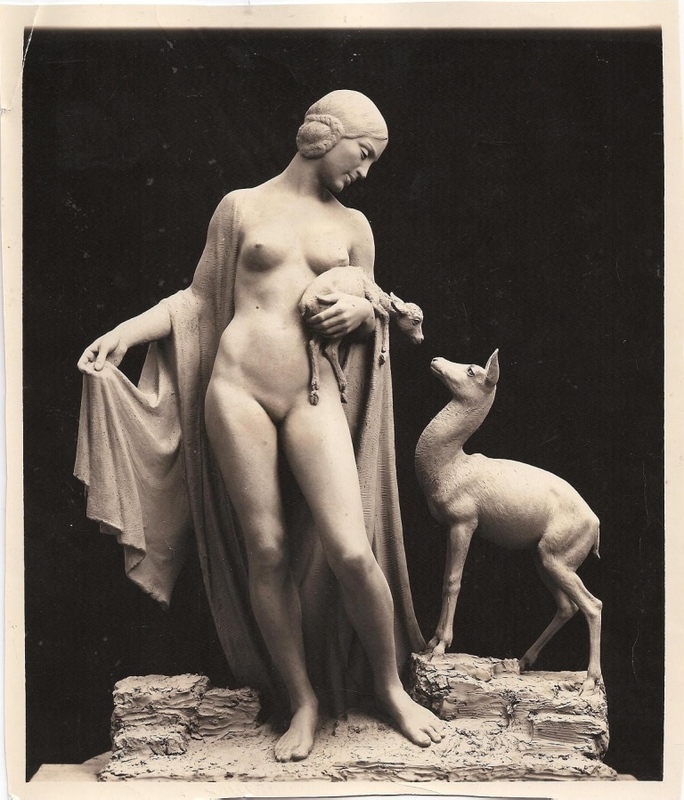 Forest Idyl, a sculpture recreated by Albin Polasek (1879-1965) in 1964. The original sculpture was created with bronze in 1924. Polasek was inspired by Henry Wadsforth Longellow's epic poem "The Song of Hiawartha." Another casting of Forest Idyl was contributed to an art gallery in New York, where the sculptor of the Lincoln Memorial, Daniel Chester French, won the sculpture in a draawing of the gallery's supporting members. 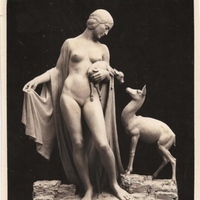 While at the American Academy in Rome, Italy, as an honorary professor in 1931, Polasek created a life-size version of Forest Idyl for sculptor Anna Hyatt Huntongton for Brookgreen Gardens, which was her estate in Murrells Inlet, South Carolina. A copy of the 1931 sculpture was also contributed to Ball State University's library in Muncie, Indiana, where she is called "The Naked Lady." For his 1964 version photographed here, Polasek used the same conceptual design that he used in 1924, but instead used the face and hairstyle of his wife, Emily Muska Kubat Polasek, as a model. This casting resides on the front lawn of the Albin Polasek Museum & Sculpture Gardens in Winter Park, and another casting of the 1964 version is located at the Winter Park City Hall. The sculpture's plaque reads: "This statue was donated to the City of Winter Park by the world renowned sculptor Albin Polasek. Mr. Polasek’s many works reflect a gratitude and appreciation for God’s world and America. He loved Winter Park, which became his 'Florida paradise.' This statue, now dedicated to his memory, is a testimonial to that devotion. December, 1966." Original sculpture: Polasek, Albin. Forest Idyl, 1964. Albin Polasek Museum & Sculpture Gardens, Winter Park, Florida. Digital reproduction of original sculpture: Polasek, Albin. Forest Idyl, 1964. “Forest Idyl by Albin Polasek.” RICHES of Central Florida accessed April 21, 2019, https://richesmi.cah.ucf.edu/omeka/items/show/5518.